We have the best deals in Aramoaia – just enter your dates and see! Book all Aramoaia hotel rooms at the lowest possible price. Looking for hotel deals in Aramoaia? Great accommodation is so easy to find with HotelGuides.ro! You may choose from a wide selection of Aramoaia hotels and make your reservation right now. No matter if you're looking for your hotel by price, location or star rating, HotelGuides.ro offers all the information you need to choose the best Aramoaia hotel for your travel needs, either leisure or business. It's so easy to find and book Aramoaia hotels. Just search for the perfect accommodation and make your Aramoaia hotel reservation today. Interested in a Aramoaia center hotel? Check and book today starting from ! Pensiunea, La struti" is situated in Tîrgu Neamţ, 5 km from Neamţ Fortress, in an area where cycling can be enjoyed. It provides free WiFi, a garden and a restaurant.The farm stay features a cable flat-screen TV.A continental breakfast is served each morning at the property.The farm stay offers a children`s playground. A terrace is available for guests to use at Pensiunea La Struti.Suceava International Airport is 52 km from the property. Offering rustic rooms with free Wi-Fi, Pension Casa Drumetului is located in Savinesti, on the national road DN15, between Piatra Neamt and Bacau. Enjoy Romanian food at the restaurant while sitting on the sun terrace overlooking the garden. Free Wi-Fi and free private parking are provided.The rooms all have air conditioning, a flat-screen TV with cable channels and a wardrobe. Private bathrooms come with a shower, hairdryer and amenities.There is also a bar, children’s playground and bicycle rental service at Pension Casa Drumetului.Piatra Neamţ and its ski slopes are 7 km away. The Savinesti‎ Train Station is 1.2 km away. 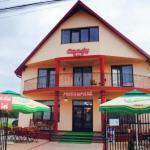 Offering a restaurant and a bar, Motel Balcost is located in Dumbrava Roşie, 5 km from Piatra Neamt. Free Wi-Fi access is available and guests have free parking on site.Rooms are functionally-furnished, provided with a TV with cable channels. The private bathrooms come with a shower and free toiletries. Some units are air-conditioned and some offer a balcony.The nearest bus stop is 100 metres away and the Piatra Neamt Train Station is 7 km away. 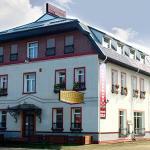 Motel Balcost is 7 km from the ski slopes 8 km from the centre of Piatra Neamt. Located in Răuceşti, Pensiunea Georgiana features barbecue facilities and free WiFi. Boasting a 24-hour front desk, this property also provides guests with a children`s playground. Guests can enjoy garden views.At the guest house, all rooms include a wardrobe. Rooms include a flat-screen TV, and certain rooms at Pensiunea Georgiana have a balcony.Durau is 48 km from the accommodation, while Piatra Neamţ is 35 km away. The nearest airport is Suceava International Airport, 50 km from Pensiunea Georgiana. Located in Dumbrava Rosie, Neamt County, Pensiunea Byblos features a bar. Boasting a 24-hour front desk, this property also provides guests with a restaurant. The accommodation features room service and free WiFi.All rooms in the hostel are fitted with a flat-screen TV with cable channels. The rooms come with a private bathroom with a bath or shower. The rooms will provide guests with a fridge.Guests at Pensiunea Byblos can enjoy a continental breakfast.Durau is 39 km from the accommodation, while Piatra Neamţ is 4.1 km from the property. The nearest airport is Bacau International Airport, 57 km from the property. Located in Tîrgu Neamţ in the Neamţ Region, 5 km from Neamţ Fortress, Vila Vlad features a barbecue and views of the garden. Free private parking is available on site.All rooms have a TV. Rooms include a private bathroom. Vila Vlad features free WiFi throughout the property.You will find a 24-hour front desk at the property.Agapia Monastery is 12 km away, while Varatec Monastery is 16 km from the property. 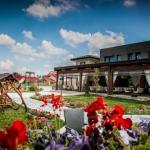 The nearest airport is Suceava International Airport, 79 km from Vila Vlad. Pensiunea Octogon in Dumbrava Rosie enjoys a rural location and provides guest rooms with free WiFi and air conditioning, free barbecue facilities, a bar and a terrace. A seasonal outdoor pool is available.Each room at Pensiunea Octogon boasts a balcony, parquet flooring and cable TV. The private bathroom in all rooms comprises a shower, free toiletries and on request, a hairdryer. Some rooms include air conditioning.The hosts can offer you advice regarding the trips you can undertake in the area.Bistrita Monastery is 12 km away. Bicaz is a 40-minute drive. Piatra Neamt’s centre and train station is 6 km from Pensiunea Octogon. The well-known Red Lake in Harghita is 60 km away. Free private parking facilities are provided at the property. Located 5 km from the centre of Piatra Neamţ, Pensiune Candy offers a restaurant serving traditional Romanian cuisine. Free WiFi is available in all areas of the property.The rooms all come with a flat-screen cable TV and a bathroom with shower, hairdryer and free toiletries.A grocery shop can be found 100 metres away and Pensiune Candy also offers a bar and barbecue facilities.The Bacau Train Station is 7 km away. Situated in Dumbrava Rosie, 7 km from Piatra Neamt, Pensiunea Classic houses an à-la-carte restaurant and bowling, as well as billiard. Free WiFi is accessible throughout the house.All rooms include a flat-screen TV with cable channels and a bathroom fitted with a shower. They have a balcony and provide views of mountains.Guests at Pensiunea Classic can make use of air-conditioned common room with sofas and a flat-screen TV.Car rental is available on site. A bus stop is 50 metres away. A train station is within 2 km. A grocery store can be found within 150 metres. Piatra Neamt ski resort is reachable within 10 km. The boutique-style Pension Byblos is located 6 km from the historic Old Town of Pietra Neamt. Rooms are appointed with wood flooring and feature a flat-screen TV and are sound-proofed. Most have views of the garden.Free Wi-fi and parking are available to all hotel guests. A children’s playground, barbecue and car rental facilities can also be used.Guests can enjoy international food and tasteful art and décor in Byblos guesthouse`s elegantly furnished dining area.Piatra Neamt train station is 4 km away. Skiing can be enjoyed north of the city Pietra Neamt on the Cozla mountain. Lake Batca Boamnei can be reached by car in 10 minutes. Featuring free bikes, Craii Neamtului is situated in Almaş. Among the various facilities are barbecue facilities and a garden. Staff on site can arrange airport transfers.With a shared bathroom, rooms at the guest house also have free WiFi.Craii Neamtului offers a terrace. Cycling is among the activities that guests can enjoy near the accommodation.Durau is 34 km from Craii Neamtului. 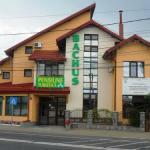 The nearest airport is Bacau International Airport, 67 km from the guest house. Located in the town of Piatra Neamt and 4 km from a ski trail, Pensiunea Bachus offers air-conditioned accommodation, a restaurant, a bar and free barbecue facilities. Free WiFi is available in all areas.All units in this guest house feature a cable TV and a private bathroom with a shower and free toiletries. Some rooms have a balcony and a minibar.Pensiunea Bachus also comprises a shared balcony and a room service. The on-site à la carte restaurant comes with an outdoor terrace for smokers.The nearest shop can be found within 300 metres and the town centre is reachable within 4.5 km. A public pool, as well as the nearest cable car, is situated 4 km from the property. Motel Aris Meridian is situated in Piatra Neamţ, 37 km from Durau and 48 km from Lacu Rosu. Free private parking is available on site.Rooms are equipped with a flat-screen TV. Certain units include a seating area for your convenience. Motel Aris Meridian features free WiFi throughout the property.Roman is 41 km from Motel Aris Meridian, while Bicaz is 23 km from the property. The nearest airport is Bacau International Airport, 60 km from the property. Enjoying a quiet location, 4 km from the Neamtului Fortess, Pensiunea Aristocratis offers air-conditioned accommodation with free WiFi and complimentary access to a sauna and fitness room.The rooms are equipped with a flat-screen TV, a minibar, and an en-suite bathroom with a bath or shower, free toiletries, bathrobes and slippers. Some rooms have a balcony and some are fitted with a spa bath.Pensiunea Aristocratis also features an à la carte restaurant serving Italian cuisine, a pizzeria, an on-site bar, a garden with a children’s playground and an outdoor terrace. At a surcharge, guests can also relax in the spa centre.The nearest bus stop and train station can be reached within 2 km. The Agapia Monastery is 15 km away. Located in Piatra Neamţ, Apartament Daniel is an apartment featuring a kitchen. The unit is 36 km from Durau. Free WiFi is provided throughout the property.There is a dining area and a kitchen complete with an oven and a microwave. Towels and bed linen are offered in this apartment. There is a private bathroom with a bath.Lacu Rosu is 48 km from Apartament Daniel, while Roman is 41 km away. Bacau International Airport is 61 km from the property. Situated in Piatra Neamt, 3 km from the ski slopes, Pensiunea Cornelius offers free WiFi, a garden with free barbecue facilities, a terrace and a restaurant. Free parking spaces can be found on site.The rooms at the Cornelius come with a flat-screen TV with cable channels, a refrigerator and a seating area. They also feature private bathroom facilities.Breakfast is served daily at the property and dinner can be enjoyed at the on-site à-la-carte restaurant. A grocery shop can be found within 300 metres and a restaurant is a 5-minute walk away.Further hotel amenities include a 24-hour front desk, air conditioning, a ski storage room and a ski equipment rental. Piatra Neamt Train Station is located 3 km away and Bistrita Monastery is reachable within 7 minutes by car. Located a 7-minute walk from Piatra Neamt Cable Car in Piatra Neamţ, Smart Apartament offers accommodation with a kitchen. This property is 1.4 km from Cozla and features free WiFi.The apartment has 3 bedrooms and 1 bathroom with a bath. A flat-screen TV with satellite channels is offered.When guests need guidance on where to visit, the reception will be happy to provide advice.A car rental service is available at this property.The nearest airport is Bacau International Airport, 61 km from the property.